A majority of uncommon dental abnormalities occur during childhood years. Dental anomalies are classified according to their abnormalities in number, shape, color, structure, texture, eruption, exfoliation, and position. Exfoliation of deciduous teeth is a normal and predictable physiological phenomenon. Over-retained primary tooth is a condition in mixed dentition phase, when the permanent tooth is erupted while the primary tooth has not exfoliated yet. One study reported that about 20.85% of children had overretained primary teeth with highest prevalence in children of 10 years old. In this study, 66.23% of over-retained primary tooth occurred in mandible with highest prevalence in second lower primary incisor and 67.55% of over-retained primary teeth were causing malocclusion. Prolonged retention of primary teeth is not an uncommon finding. The possible causes for this condition are 1) Absences of the permanent teeth, 2) The presence of dense sclerotic bone around the crown of permanent tooth, 3) Failure in normal resorption of roots of the primary tooth, and 4) Deviation in the eruption of the teeth due to systemic disorders. 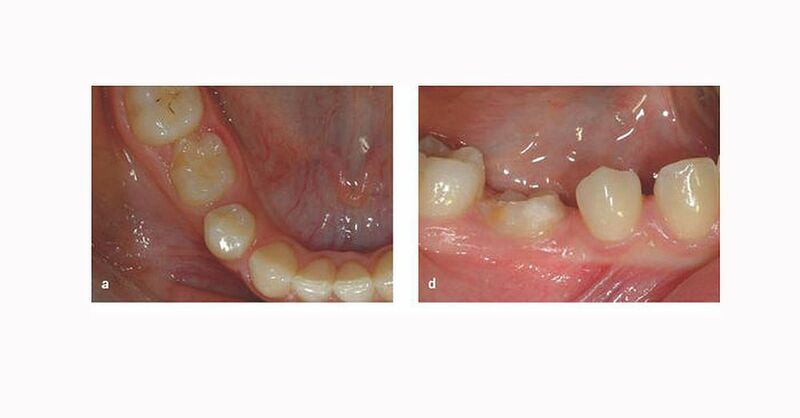 This article presents an unusual case of a nonsyndromic adult female with the simultaneous presence of primary and permanent teeth.